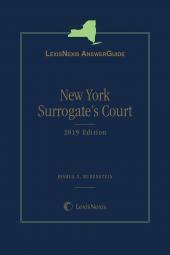 The one-volume LexisNexis AnswerGuide New York Family Court Proceedings provides direct, New York-specific answers to questions that arise in day-to-day practice. It covers important topics related to family practice, including initial pleadings, child and spousal support proceedings, paternity proceedings, and child protective proceedings. 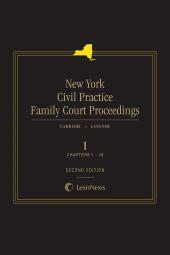 Authored by Joseph R. Carrieri, Esq., with contributions from leading family law practitioners, this indispensable one-volume guide provides procedural coverage for every New York Family Court proceeding. To ensure best practices and avoidance of potential practice pitfalls, LexisNexis AnswerGuide New York Family Court Proceedings includes 90 detailed, task-oriented checklists, and more than 100 practice pointers (Warning, Strategic Point, Exception, Timing) on important topics, including initial pleadings, jurisdiction, persons in need of supervision (PINS), juvenile delinquency, child and spousal support proceedings, paternity proceedings, termination of parental rights, adoption proceedings, custody and visitation proceedings, family offense proceedings, and child protective proceedings.